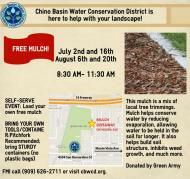 Free Mulch and Compost Giveaways from 8:30-11:30am on the First and Third Saturdays of each month. Self-serve event: Bring your own tools and containers. A pitchfork, face mask, and sturdy containers are recommended. Mulch is a mix of ground local tree trimmings. Mulch helps conserve water by reducing evaporation, allowing water to be held in the soil for longer. It also helps build soil structure, inhibits weed growth, and much more. All mulch is donated by our friends at Green Army. This mixed mulch contributes to improving soil more than store bought bark or dyed mulch. Compost is donated by the Inland Empire Regional Composting Authority (IERCA) who manufactures SoilPro Premium Compost Products. To see lab results for the compost, click here. While you're here, visit the Demonstration Garden, find out about our other free programs and landscape classes, and get any landscaping questions you have answered by our staff! If you are a community group such as Boy Scouts, a community garden, school, or other group and are working on a project, you may arrange to pick up mulch on another day. Please contact our staff for scheduling. Enter side gate on Helena Ave.